The day after VE Day. 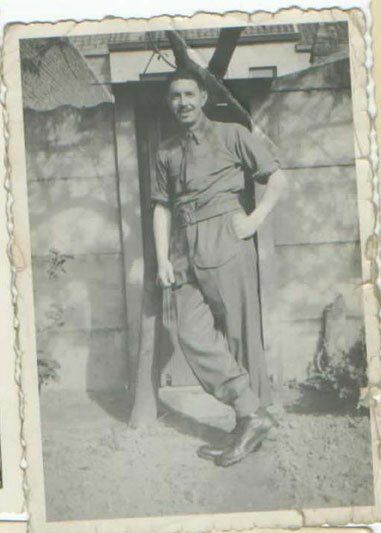 The 70th anniversary of VE Day seemed like a good time to blog about my grandad’s soldier photos from WW2 – mainly because, although there’s no photo of him on VE Day itself, the one above, where he’s wearing a large smile, and leans casually against a gate, relief on his face, was taken the day after. My grandad, Bert Nunn, was meticulous with his photographs, never failing to write on the back of them to identify where he was and who he was with. Perhaps he did this with his photos from 1945 because he knew that the end of hostilities were nigh, and soon he and his comrades would head home once more and might never see each other again. In early 1939, my grandad had started preaching on the Methodist circuit in south-east Essex, specialising in preaching to children. He told me once that he nearly became a conscientious objector, but something stopped him. I think he was paying attention to the history unfolding right in front of him; he said that, rather than wait for conscription when he wouldn’t get much choice of where he went, he signed up voluntarily. He started off the war driving about the marshes on the Essex side of The Thames, apparently in a bread van like something out of Dad’s Army, with poor weaponry. From one of his uniform patches, which is an aeroplane with a sword through it, he appears to have been something to do with anti-aircraft – it would make sense, given that he lived in Southend, on the mouth of The Thames, so would’ve been in prime position to shoot down any enemy planes that decided to fly towards London using the river as a guide. How he felt doing this, considering that he’d nearly gone into the RAF himself, and had a cousin who joined (and died in action), I can’t imagine. He entered Normandy on D-Day, landing on Juno beach with the Canadians, although he was in the Royal Artillery in the British Army. They worked their way up to Belgium and the Netherlands.1)I have sometimes wondered if he landed in the days afterwards – I’m not entirely sure. But he was very appreciative of the D-Day 50th anniversary commemorative tea-towel we got him in 1994. I remember going round to see him one afternoon and he was in a bad mood. “I’ve just been watching an American film where the Yanks rescue everyone in Holland – well, what rot, I remember saving them when they got stuck on an island there!” He refused to watch Saving Private Ryan, because he said, “It’s very realistic, apparently – well, I saw it the first time round and I don’t need to see that again.” Alas, no-one has yet made Helen’s Grandad’s War Experiences The Movie, (unfortunately – his war stories that he told my brother and me were mainly about charming mayors’ wives for food, and sleeping in haunted, bombed-out chateaux) so some of his photograph collection will have to do. I’ve added the names of everyone he identified, so if you spot someone you know, do get in touch. I’m quite aware that this might be a photo of your dad or your grandad (or even yourself!) 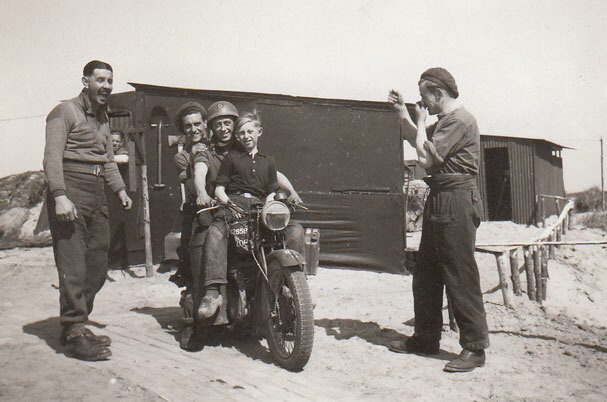 – and Wee Gussie, “the little Dutch boy” (who the soldiers paid in food rations for his help around their camp, although it looks like there was plenty of good-natured pratting about going on too!) must be in his late 70s or early 80s by now. Left to right: back row: Gus, ‘handsome (? )’, Jock, Tommy and Syd. 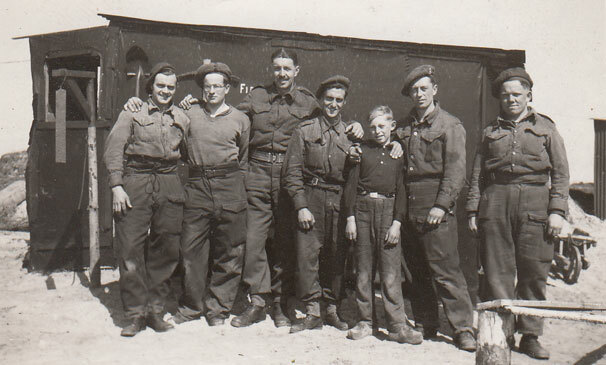 Left to right: Geoff, Johnny, ‘Guess who?’, Syd, Gussie, Ralph and Denis. Frank Dale, myself and Ben Newing. Ruddervoorde May 1945. 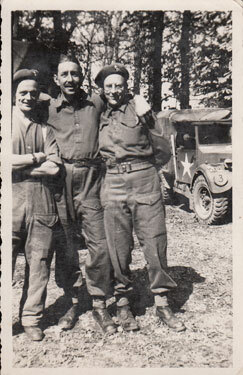 Bert visited here May 1945 from Ruddervoorde with Sgt G. Wright, Sgt Bill Laurenson, Sgt Wally Reid. [It’s unclear if these are from before or after VE Day. 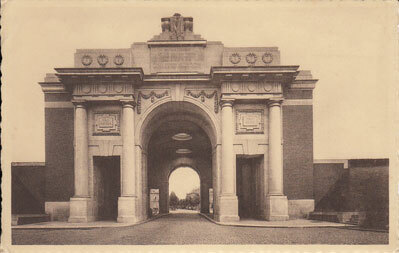 It’s possible they visited the Menin Gate after VE Day, in an act of thanksgiving: they had survived]. 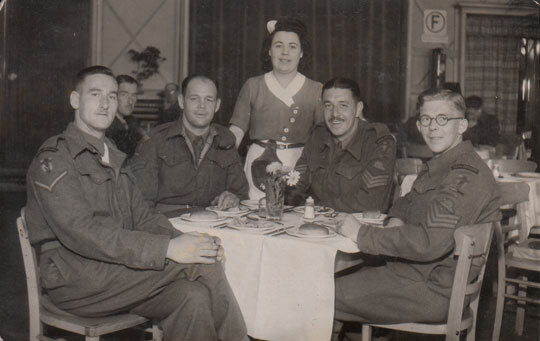 ‘Montgomery Club’ Brussels 9th June 1945. L/Bdr Wildin R., Cpl Bridgeman W., myself, Sgt Read W. A. 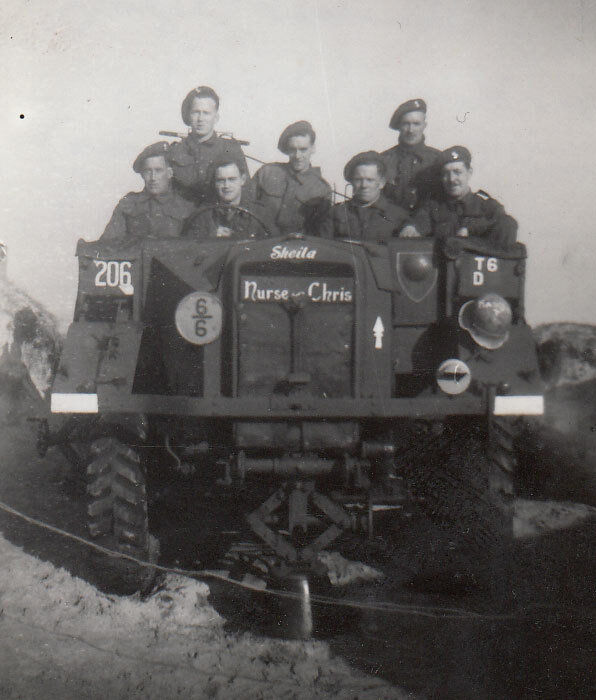 [A NAAFI club for the British Army. Having your photo taken while eating your dinner there wasn’t unusual, as you can see from this photo on Flickr. Except my grandad got the waitress to appear in his photo]. Another item in the Quality Street tin of my grandad’s Army memories is a bundle of photos held together in an elastic band of a man and his girlfriend/wife picnicking, horseriding, strolling about a summer countryside.2)I will scan them and put them online one day. 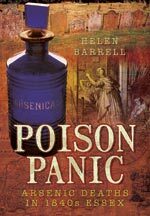 If only the whole of WW2 was as free of bloodshed as that transaction had been….3)Of course, that light-hearted tale might mask something more sinister. 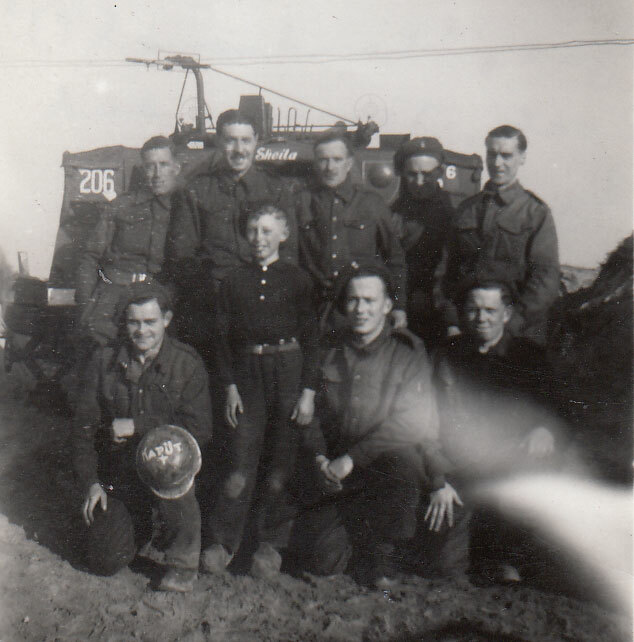 As much as my grandad liked to talk about his time in the war, he never talked to me about death, and refused to answer my brother’s gleeful question of ‘How many people did you shoot?’ Perhaps his ghost stories were his way of conveying that aspect. 1. ↑ I have sometimes wondered if he landed in the days afterwards – I’m not entirely sure. But he was very appreciative of the D-Day 50th anniversary commemorative tea-towel we got him in 1994. 2. ↑ I will scan them and put them online one day. 3. ↑ Of course, that light-hearted tale might mask something more sinister. As much as my grandad liked to talk about his time in the war, he never talked to me about death, and refused to answer my brother’s gleeful question of ‘How many people did you shoot?’ Perhaps his ghost stories were his way of conveying that aspect.